I took my children (4 & 10) to Dreamworks How to Train Your Dragon 3D last week and enjoyed it thoroughly. I wasn’t sure what to expect. At that point I hadn’t read any of the books but the title was intriguing and I love dragons so off we trooped. The movie opened with a dark, night-time, fiery battle between the Vikings of Berk and their numerous dragon foes – setting the scene for the rest of the fast-paced movie. Hiccup – the weedy, inventive son of the massive Stoick, chief of the Hooligan tribe, wants to get in on the dragon fighting action. However, his father wishes to protect his un-Viking-like and accident prone only son from danger. Using one of his clever inventions, Hiccup manages to entangle a legendary Night Fury, one of the most mysterious and devastating of the many highly dangerous varieties of dragons on the Isle of Berk. The problem is that no one else notices before he manages to cause his usual accidental mayhem. Next day Hiccup tracks down the injured dragon. Tangled in his net, the Night Fury is at his mercy yet he finds himself unable to kill it. Hiccup makes friends with the dragon, whom he calls Toothless. Even as Hiccup is finally allowed to join the dragon fighting initiate training, his knowledge of dragons deepens through his interactions with Toothless. He begins to realise that all that the Vikings know about dragons is fundamentally wrong. Meanwhile, his father sets off with the fleet to find the secret nest to eliminate the dragon threat once for all. Events are set in train that inexorably lead up to the dramatic almost cosmic conclusion of the film that pits father against son, Vikings against the dragons, and everyone against the gigantic (sea) dragon the size of the mountain and with an insatiable appetite. The 3D element adds to the viewing experience without being intrusive. The gentle drift on ash seemingly over the audience during the final scenes of the movie was particularly poignant. No doubt, readers of the book will have realised that the movie has made major changes to the original story written by Cressida Cowell. The majority of the Hooligan tribe’s characters are indeed present – Hiccup, Stoick, Gobber the Belch, though notably Hiccup’s mother is dead and the tough, smart, beautiful Astrid (who bears strong resemblance to Camicaze of the later books) has been added. Hiccup’s struggle to find acceptance and respect with his tough Viking tribe, his peers and his father and his introduction of creative, new ways to deals with dragons is still present though dramatically changed. The movie is less whimsical, more serious, stark and dramatic. In many ways, the movie is reminiscent of Chicken Little both in father-son dynamics (the big, successful father who is disappointed in his small, inventive son and never seems to listen) and in its dramatic encounter with an “alien” species. The setting is both like and unlike the book – the boggy and isolated Isle of Berk – though the other tribes have been jettisoned for the movie and the relationship between the Vikings and the dragon is significantly different (for in the book the Vikings already tame dragons basically through intimidation – whereas Hiccups learns to speak their language). In other words, the film has all the trademarks of Hollywood, dramatic action, epic battles with impossible odds, romantic interest and a streamlining of characters, situations and settings. Both book and movie make the points that while a son (or daughter presumably) may not follow in his father’s footsteps, he may still make a name for himself and that intelligence, diplomacy, compassion and friendship may be a more effective approach in conflict with outsiders than brute force. The first point – that parents need to beware of imposing their own desires and dreams on their children is certainly true though a frequent theme in children’s movies. That the alien and hostile enemy may in fact have common interests and needs to our own that can be appealed to is indeed refreshing. Hollywood so often seems to divide aliens into either friendly, innocent beings vulnerable to the machinations of power or money hungry humans (see Avatar or the classic ET for instance) or hostile, unreasonable and power or resource hungry monsters that need to be mercelessly anihlated (for instance Monsters versus Aliens 3D, Independence Day, War of the Worlds and countless others.) Such simplistic and one-sided characterisations glosses over the uncomfortable reality that humanity, indeed each human being including those on “our” side, has both the capcity for good and evil. I found both the movie and the books entertaining and thoroughly enjoyable though in different ways. As for my children, my 4-year old son was bored (after poking out the eye piece of his 3D glasses) and my daughter (10 going on 15) thought it was “okay but a bit young for her.” However, my friends’ three boys (aged 9-14) thoroughly enjoyed the movie. 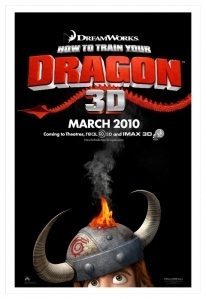 I would recommend How to Train Your Dragon 3D for kids between the ages of 6-12, though it may particularly appeal to boys. The movie is rated PG for action, scary images and mild language.